Self-aggrandizing con man? Shrewd promoter? Or scruffy American hero? 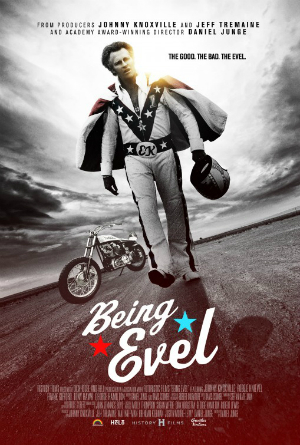 Daniel Junge’s new documentary about stunt-bike extraordinaire Evel Knievel, titled Being Evel, levies all these questions and more. It paints each episode of his life via talking head interviews of friends, family and co-workers while supplying tons of archival footage which allows the viewer to draw their own assumptions about the man. Good or bad, Being Evel is a fair and level headed look at a somewhat complicated icon. Born and raised in the frontier atmosphere of Butte, Montana, the film reveals the cantankerous attitude of young Evel even then, running from the law on his bike and stirring up juvenile trouble whenever possible. Married at a young age and unable to satisfy his adventurous inner cravings by settling down in life, Evel promptly sped away to California and caught the attention of newsmen and TV stations by performing wheelies and stunts up and down the sun-drenched streets. From that point on, Being Evel charts his unusual ascension to TV stardom and aw-shucks popularity through the random stunts he continually challenged himself with. Jumping over the fountains at Caesar’s Palace. The literal bone-crunching wipeout he performed on national TV trying to jump a line of school buses. The controversy of his jaunt across a literal mountain canyon. Being Evel presents all of this through the remembrances, memories and affectations of those close to Evel. It all makes for startling documentary stuff. Interspersed through the recorded facts, filmmaker Junge has assembled a fairly complete roster of people who personally knew Evel and were involved with his day-to-day activities. Even though we do get some of the ubiquitous star-gazing-hero-myth from the likes of Jackass star Johnny Knoxville and pro skater Tony Hawk, Being Evel mostly maintains its neutral air, juxtaposing those lovingly rendered assertions against the guarded and perhaps resentful viewpoint of Evel’s first wife, Linda. Constantly cheated on and abandoned by Evel numerous times, Linda’s minimal choice of words and inability to fully express herself beyond snippets of curt explanation reveal a damaged woman that would have made a great documentary on its own. Likewise, the salacious aspects of Evel’s life — such as his thorny relationship with the prevalent media, the violent outburst against his once manager Sally Saltman and his sharp decline both physically and mentally into old age — are explored in detail. In the case of the Saltman attack, it’s Saltman himself who recounts the incident. Unlike so many documentaries about pop culture messiahs or national icons, the people who experienced the touches of greatness (or fallacy) are no longer present. Being Evel has the good fortune of documenting a man of the recent past whose lifelines and relationships are still vital and walking. Through it all, the most interesting aspect Being Evel raises is the question of what made Evel so popular. We all knew (or did it ourselves) those kids who pushed the envelope on their bicycles, jumping home made ramps of bricks and particle board. Or, as one short home movie in the film shows, a bike jump over two or three neighborhood friends lying down. It’s also possible, Junge suggests, that Evel came along at the right time in our nation’s history. Weary from Vietnam and Watergate, Evel embodied a ragged, almost pointless sense of self adventure and bullheaded conviction. No matter how many times he crashed or broke a bone, he got up and immediately spoke to the gathered crowd. If that’s not a perfect allegory for the American spirit, than I don’t know what is. And perhaps that answers the question to the first three I poised in this review. Being Evel suggests that we need more Evels in the world. Being Evel opens for a limited engagement on Friday, August 21, at the Texas Theater in Oak Cliff.